Undoubtedly, a tiled floor gives any space a clean and spacious look. Not only do tiled floors add an additional appeal to the overall look of a house or commercial space, but they also make kitchens and bathrooms look aesthetically pleasing. Generally easy to clean and maintain than their carpet counterparts, tiled floors are the primary flooring choice of many homeowners. However, while tiled floors do contribute to aesthetics, dirty or stained tiles (especially those of a lighter shade) can ruin a kitchen or bathroom in no time at all. This is especially true for darker grouts, which, when stained, can look immensely dirty even when the overall room is clean. Thus, while actual tiling itself is relatively easy to maintain here is how you can keep your tiled flooring clean and sparkling. 1. Choose the Right Cleaning Brand:- Although there are a range of tile grout cleaners available in the market, it is important to choose the brand that best meets your needs. Commercial tile grout cleaners almost completely eliminate the need of excessive scrubbing, as they put the stains away with only a minimum amount of effort. 2. Choose the Right Solution:- If your grout is starting to look dull, it is best to choose a grout cleaner that brings the brightness back. Again, there are many options available here as well. However, as an added advantage, try to choose a cleaner that has anti-fungal properties. Anti-fungal grout cleaners are ideal for bathrooms where mould easily piles up in the corner of the tiles. The warm environment found in bathrooms encourages the growth of fungus, which can easily be wiped out with a commercial anti-fungal grout cleaner. In the “commercial tile-grout cleaners” product line, you can also opt for bleach products. Bleach based products are stronger than the normal grout cleaners and possess the ability to get rid of stains in almost no time at all. However, bleach based solutions are to be used with extreme caution and should only be used on light colored grouts as dark tiles often fade away with the application of bleach. 3. Apply & Clean with Care:- Once you have decided on the brand and type of tile grout cleaner to use, the next step requires you to actually use and apply the product with care. This is where caution must be taken to ensure the cleaner provides the best possible results without damaging the flooring. To begin with, use a dry cloth or mop to clean the tiles beforehand so you have better access to the actual grout before applying the cleaner. Next, apply the cleaning solution proportionality on the tiles so that it covers the tiling adequately. The cleaning solution must be left to soak in for half an hour, so that it can work on the stains effectively as well. Afterwards, use a brush to clear the solution and then rinse the entire floor properly. 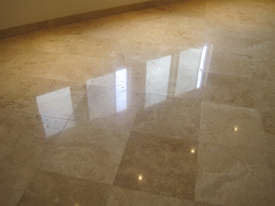 While cleaning tiles sounds easy, damaging the expensive flooring during the cleaning process is inevitable. Therefore, it is recommended to seek professional surface cleaning help when it comes to cleaning hard surfaces. We, at Advanced Surface Solutions, provide expert surface cleaning services with a staff that is highly trained in the field. The tile cleaning services we offer ensure that your flooring retains its new shiny look, remains damage free, and is granted a long life.